Epsom runner-up Jack Hobbs turned in a brilliant performance to take the glory in the 150th Dubai Duty Free Irish Derby at the Curragh. The John Gosden-trained colt found stable companion Golden Horn too hot to handle in the both the Dante at York and in the Investec Derby, but with his old rival back in Newmarket being prepared for next week's Coral-Eclipse, Jack Hobbs was the 10-11 favourite to enjoy his big day. The market leader broke smartly under William Buick, carrying the blue of Godolphin, before being taken back to settle in third place. Epsom third Storm The Stars took the field along for much of the mile-and-a-half journey, but Jack Hobbs loomed alongside ominously straightening up for home. Once let down by a confident Buick, who had ensured there was never any likelihood of being hemmed in by Giovanni Canaletto off the turn, Gosden's charge quickly asserted and galloped on relentlessly for a runaway success. Storm The Stars ran an excellent race from the front in second, with Giovanni Canaletto back in third. Those ridden more patiently, including Aidan O'Brien's Oaks heroine Qualify and her well-fancied stablemate Highland Reel, never threatened to land a blow. Gosden said: "It was genuine good to firm ground and it's nice to see the form from Epsom working out so solidly. "He travelled really well and William just waited after he came at the head of the straight and I loved the way he finished off his race. "The second horse has run a blinder and he was third at Epsom. "We'll put him away now and go for the Prix Niel and then on to the Arc (Prix de l'Arc de Triomphe). "He needs a holiday. He's a big, rangy horse and he just needs some time to fill out." 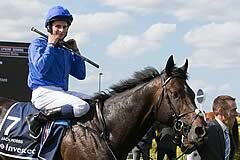 RaceBets introduced Jack Hobbs at 7-1 for the Arc at Longchamp on October 4. Buick said: "That was fantastic. He's a great horse. "I had a lot of belief in him before Epsom and he was even better today. He's a horse that's improving all the time. "It's fantastic to win an Irish Derby, but it's just great to ride horses like him. "He's been handled brilliantly by John. He's obviously a late maturing horse, but he's really coming to himself now and he's a serious horse. "For Sheikh Mohammed and all the (Godolphin) team, it means everything to us. "Everyone works very hard behind the scenes and to get days like this is brilliant."